Ads are an essential part of marketing. Without ads, nothing would sell, especially in the car industry. Ads today are such a common part of everyday life that there are new, diverse demands. Ads have been around for years and years. As a seller, if you really want to get attention for your product, the advertisements must be creative! Not just any regular ad will attract customers in our modern society. Included is a picture of an unusual ad for a Mitsubishi SUV. It shows that underneath the shell of the car there is a rhinoceros. 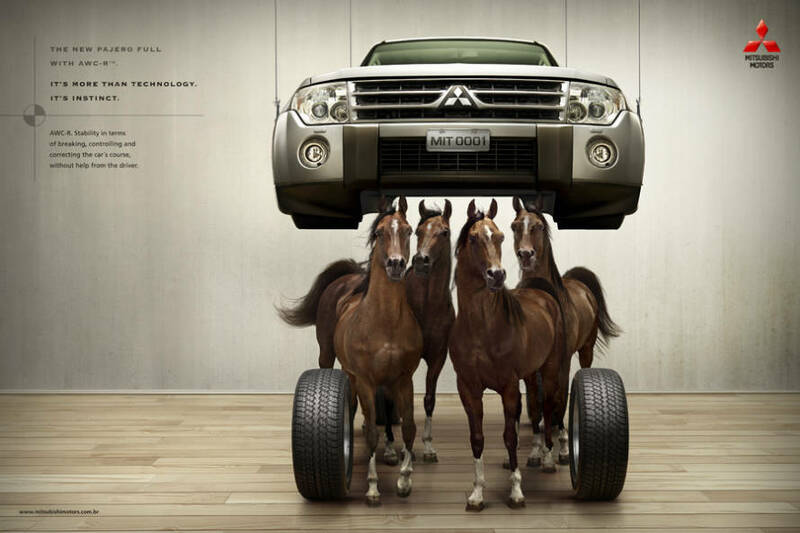 This is a creative way mitsubishi is showing how powerful their cars are. The suggestion is that this particular model of car is as tough as a rhinoceros; that the car is built sturdy and the engine is strong. The second ad is very similar. Instead it is showing that underneath the car’s shell there are horses which is a direct correlation to horsepower. Mitsubishi is trying to sell the fact that this car is all about horsepower. The fact that only the shell is removed, to reveal whats underneath, and not the tires shows that the animals represented most likely refer to engine strength. A few words are put onto each advertisement as well. 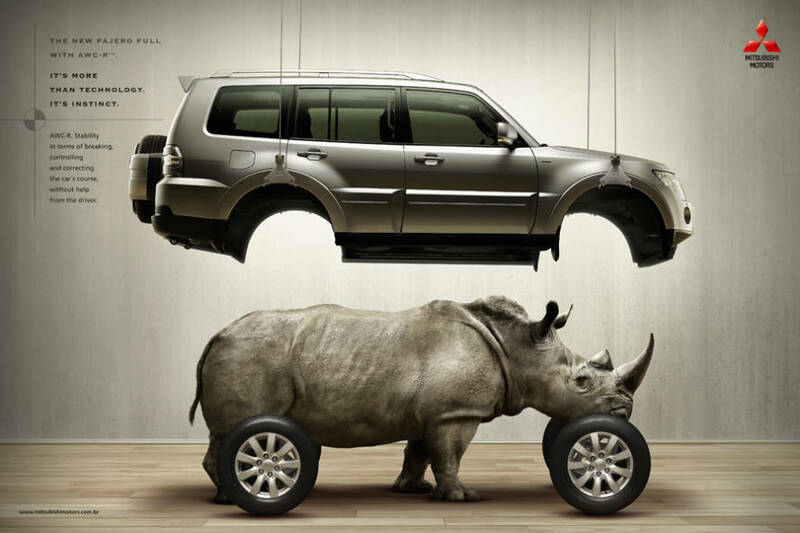 The word “stability” is used in both pictures which is probably why horses and rhinoceroses are underneath the car: two very stable animals. Most of the time, with car ads, it is beneficial to add statistics such as horsepower, MPG, prices and more. Yet, these ads have done a great job describing the power, stability and reliability without using numbers.